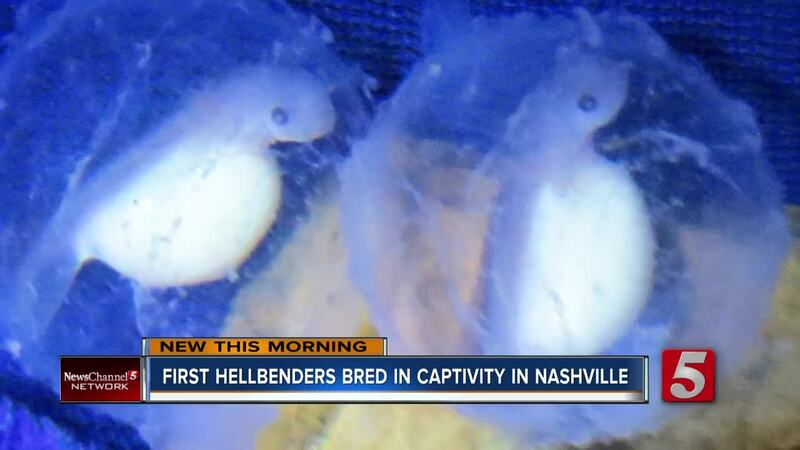 The Nashville Zoo is celebrating a major breakthrough -- 24 Hellbenders born in captivity. NASHVILLE, Tenn. (WTVF) — The Nashville Zoo is celebrating a major breakthrough -- 24 Hellbenders born in captivity. "They're North America's largest salamanders. They can get up to about 2 1/2 feet long," said Sherri Reinsch, lead herpetologist at the Nashville Zoo. "They live in rivers. They like fast-moving clean, clear, cold water because they breathe through their skin. Cold water has more oxygen in it so it makes it better for them," she said. Reinsch says the zoo is excited that after years of trials they have a technique that works. "We're doing a few things at the zoo to try and help them. We're doing captive breeding because up until now we're the only institution that's ever bread the Eastern Hellbenders in captivity," she said. The 24 eastern Hellbenders are the largest success in seven years and represent a huge step towards re-populating Hellbenders in the wild. "The Hellbenders are declining in most of their range. They're from New York and Pennsylvania all the way down to Northern Alabama and Georgia," she said. She says Hellbenders are the "canaries in the coalmine" and their decreasing numbers are a bad sign. "For them to all of the sudden start having problems it's really an indication that there something wrong with our environment," she said. She hopes one day soon they can re-release genetically diverse Hellbenders back into Middle Tennessee and says keeping our rivers and streams clean is critical for their ongoing survival. You can see these very first Eastern Hellbenders that were bred in human care on exhibit in the "Unseen New World" at the Nashville Zoo. For more on Hellbender conservation efforts click here .